The ideal display tape. 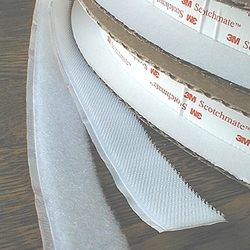 Scotchmate is 3M's version of Velcro. This tape comes in both Hook and Loop with an incredibly strong adhesive that is stronger than the hook and loop system. The tape will hold just about anything together and peels cleanly and easily apart. Available in 1 inch width by the yard or big 50 yard rolls. Colors: white or black.